This recipe is another classic hit from Brenda and Liisa Grondahl (my aunt and cousin who gave me the Blueberry Muffin recipe that so many of you now love!) 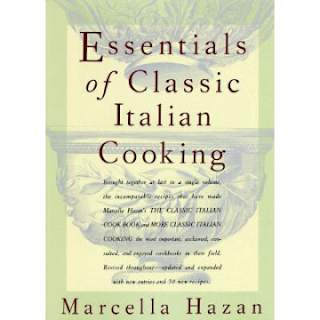 Brenda discovered it at The Pantry at the King's Inn in Putnam, Connecticut and worked out the recipe at home. The restaurant is no longer there, but thankfully the recipe continues to circulate among Army Wives around the country. I still remember the very first time I had this. I remember the day, the building, the dining room, what I was wearing. It was such a memorable and pleasurable taste for me. It was the first time I'd ever had a cold soup (even though they do a number of cold fruit soups in Finland.) I've made this at baby showers and bridal luncheons. It became a signature dish for me and I still love it. 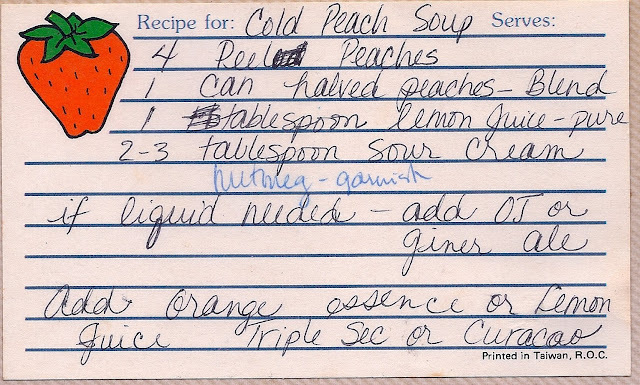 I'm posting the original recipe card that uses a combination of canned peaches and fresh peaches. It is the no-fail, five minute version. However, because I'm lucky enough to use the Gerawan's Prima peaches, I can leave the skin on them because the variety doesn't have any fuzz on it. When I make this soup for catered event (which can be served in shot glasses as a tray passed hors d'oeuvres or as an elegant first course) I don't use the canned peaches. I use all fresh peaches. I saute half of them with with either sugar or agave. Then I combine the cooked peaches with the fresh peaches in the blender with some orange juice and lemon juice. The fresh lemon juice really brightens this and makes it pop. But if you don't want to hassle with the sauteing then just use half canned peaches and half fresh peaches and follow the recipe above which tons of people have been making for years. Cook peaches in butter and sugar until soft and sweet. Put cooked peaches, uncooked peaches, orange juice, lemon juice in blender. Blend until pureed. To serve, place in bowls. Garnish with creme friache (or sour cream) and freshly grated nutmeg. Serve chilled. Peaches, Watermelon and Blueberries are some of the true tastes of summer for me. I hope this soup helps you enjoy the lingering days of the end of the season.